Ever wonder what it’s like to be an archaeologist? 2018 was my first full year working as a professional archaeologist. I went back to school in 2009 to study archaeology. Archaeology is actually a sub-field of anthropology, so I went for a degree in anthropology with a focus in archaeology. 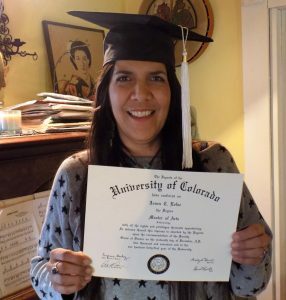 I received my Bachelor’s degree in 2012, and I finally got my Master’s degree in in 2017. That was quite an accomplishment for me, as I did it all as a 40-something single mom of two boys, working several part-time jobs! I didn’t do graduation, but here’s the proof! But that aside, this has been a year full of ups and downs for me, and a bit of a trial by fire as far as getting my foot in the archaeological door. I really love my career in archaeology. It’s pretty fun most of the time – at least for me. It certainly wouldn’t be fun for everyone, because there are several aspects to it that can be very difficult. 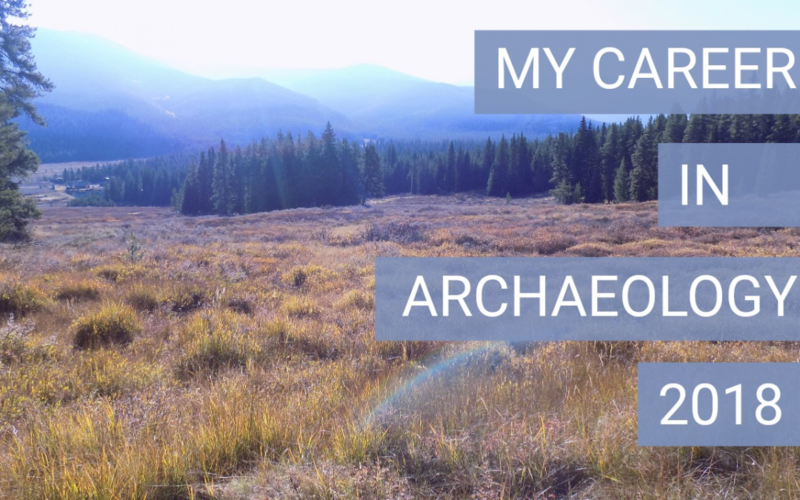 If you have ever wondered what it’s really like to be an archaeologist, or perhaps have thought about becoming an archaeologist, I’m going to share with you some of the pros and cons of a career in archaeology. Because there are certainly both pros and cons. There are lots of different kinds of jobs in archaeology, but I currently work in CRM. In case you don’t know, CRM stands for Cultural Resources Management and my official title right now is Cultural Resources Specialist. It’s really just a fancy name for an archaeologist, but it encompasses a little more than what people usually think of when they hear the word archaeologist. Either that or they proceed to tell me about some new dinosaur find or some other comment about dinosaurs. This is a common mistake and one that I want to clear up RIGHT NOW. Paleontologists study dinosaurs, extinct creatures, plants, and environments. They do this by studying fossils. 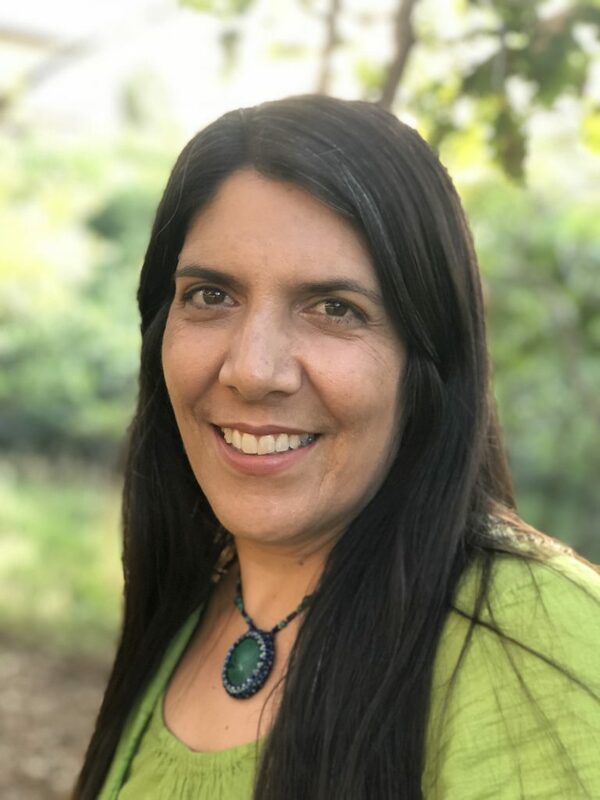 Archaeologists study people of the past, including things like how they behaved, what they ate, what their economies were like, what their social structures were like, how they utilized their resources, and how they buried their dead, among other things. All of these things give us insight into how societies developed into what we know today. Archaeologists do this by looking at artifacts or what we sometimes call material culture. A Native American grinding stone with pecking. Artifacts are all the physical, tangible objects that we leave behind, including things like buildings, tools, household items, clothing, food remnants, and sometimes even poop. Yes, poop…we call it a coprolite, which means “fossilized dung”. Yes, it kind of sounds like we look at people’s trash, and that’s actually pretty accurate. Often times, the best artifacts are found in ancient trash piles, or what we like to call middens, and there have been whole archaeological studies conducted around analyzing people’s trash! Lots of lard cans – obviously not vegans! 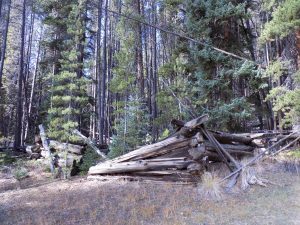 In fact, a lot of the archaeological work I did this summer involved recording trash dumps from mining camps in the late 1800’s and early 1900’s, high in the mountains of Colorado. This was part of what we call archaeological survey, which basically involves a crew of two or more people walking in straight lines or transects, in order to cover a large area, looking for artifacts. Sometimes, they are prehistoric artifacts, sometimes they’re historical artifacts, and sometimes they’re a combination of both. Just remember that what archaeologists do is not just for fun. We usually conduct an archaeological survey because any government-owned land that is going to be developed or used for some purpose that might change the landscape in some capacity requires an archaeological survey. This is done so that any cultural resources, or archaeological sites can be recorded and preserved if necessary. If we survey the area and find evidence of a historic or prehistoric site, an excavation might have to be conducted, or some other method of collecting data and/or preserving the site. Archaeologists don’t usually collect artifacts during a survey. That usually only happens when an actual excavation is conducted and a lot of information is collected on the artifacts before they leave the ground. This includes a GPS point or other mapping tool to record exactly where the artifact was found. Was it on the surface or underground? How deep was it underground (in exact measurements)? How many other artifacts were around it and what type? 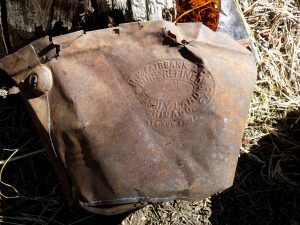 What was the artifact and how was it used? What are the measurements of each artifact? All of this information will be written on a card and everything placed in baggies, which are then taken to a curation facility for further analysis and storage. 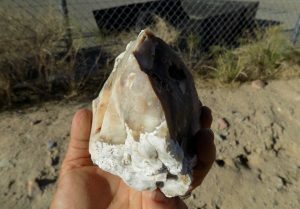 An artifact found on the side of the road at Ft. Irwin, CA. LEAVE IT WHERE YOU FOUND IT! If you ever find an artifact on the ground LEAVE IT WHERE YOU FOUND IT! When people collect artifacts, even when they just pick them up and move them to another spot, it compromises the archaeological record. That’s because it is no longer in its original context and it makes it difficult for archaeologists to know exactly where that artifact came from or how it was used. Of course, when things are on the surface, they can get moved around over time by natural forces, such as erosion, animals, or people. 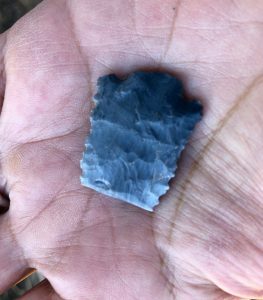 For instance, if there was a site full of arrowheads (or what we like to call projectile points), and someone came along and collected them all, no one would ever know that that was a site where a lot of hunting or tool manufacture happened in the past. A broken projectile point made from chert. Then later, say the person who collected all of those arrowheads decides they want to give them to a museum. The museum probably won’t even want them because they don’t know exactly where they came from or in what context they were used. At that point, the artifacts are essentially just pretty objects that researchers don’t have a lot of use for. Not to say that they are completely useless, but it just makes it a lot more difficult for a researcher to study artifacts if they don’t even know where they came from! 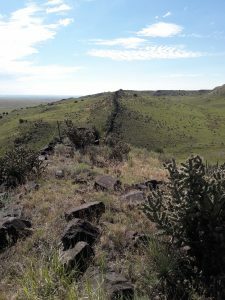 The Hogback formation at the Pinon Canyon Maneuver Site. The first year of my career in archaeology had some really big ups and downs for me. At the beginning of the year, I was working at Fort Carson, in the Colorado Springs area. Since it was winter, the work was mostly in the office, working on reports for all the work that we had done over the summer. The field work we did involved monitoring sites that had already been recorded. 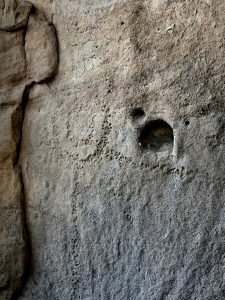 Since we were working on a military base where they do training with guns and tanks, etc…, we have to make sure that all the archaeological resources are protected and not getting run over, shot up, or otherwise vandalized. We also have to keep an eye on natural impacts to the sites such as erosion, animal burrowing, and wildfires. 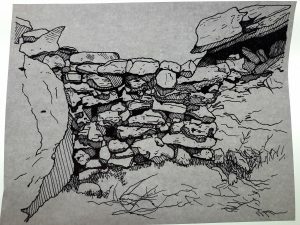 I created this illustration of a historical rock wall. Because I also have a background as an artist, I often get assigned the task of creating illustrations of site maps and artifacts, so I was doing a lot of drawing by hand and also in Adobe Illustrator. I really enjoy doing that kind of work because I think it utilizes both my artistic and archaeological skill sets. I created some illustrations that I was really proud of. I just wish I had taken pictures of more of them! But one of the problems with working in CRM is that most of the work is contract-based. That means that when a contract is completed, if the company you are working for doesn’t have another contract in place, you’re out of work. SO, at the end of March, that’s what happened. The contract ended, I got laid off. About a month later I got a call from the company I had been working for, asking if I wanted to do a month long contract in the Mojave Desert. Since I needed work, I said yes. I had very mixed feelings about working there. It was interesting working in a different place, but it was very hot and dusty. We had to stay on Ft. Irwin, which is pretty remote, and the closest grocery store was 45 minutes away! I was very glad that I brought a lot of my own food supplies, as well as a hot plate and pots and pans. That way I was able to make my own meals. Otherwise, I would have been eating fast food, which isn’t a very good choice for anyone, much less a vegan! One of the things I love about my career in archaeology is that we work outdoors in remote places and we often see a lot of wildlife. A lot of the time, it’s hard to get any footage of the animals we see, because they are too fast. By the time I get my camera out, they’re gone. But sometimes there are some more slow-moving critters, such as a desert tortoise we found hiding in its burrow. 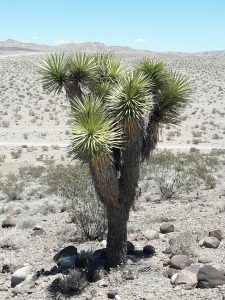 There were big fat horned lizards, and wild burros that wandered freely around Fort Irwin. 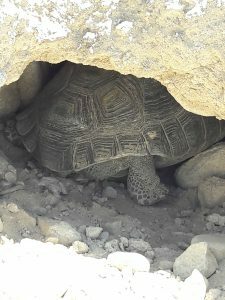 A Desert Tortoise in its burrow. In Colorado, I see things like a variety of hawks and eagles, pronghorn antelope, deer, elk, coyotes, foxes, porcupines, bighorn sheep and moose. We even saw a llama train in the mountains! And then there’s the rattlesnakes and red racers! But fortunately, I haven’t seen too many of those! This summer up in the Gunnison area, we witnessed an unusual thing (for me, anyway). For a period of about two weeks, the road that we took to get up to our work area was being used as a cattle run! These cattle had spent the summer grazing near a reservoir, soaking in the summer sun and fresh air. But when fall came, they were rounded up to get them back on the ranch and safe for the winter. 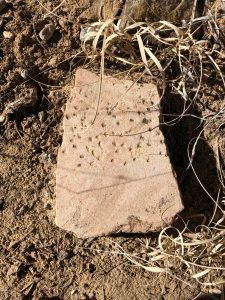 So, every day, these cattle were wandering freely down the road – on the side of the road, in the middle of the road – and leaving plenty of their own little “artifacts” behind! 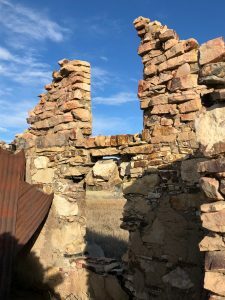 The ruins of an old mining camp cabin. to the deserts of California. 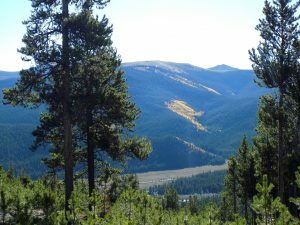 I particularly loved driving through the mountains of Colorado where there are lots of old west mining towns like Leadville. 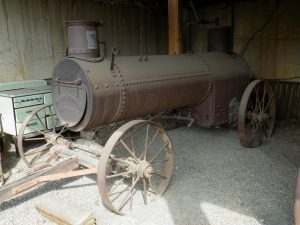 This town had old-fashioned saloons, an old opera house, and a museum with lots of mining artifacts. A steam pump used in mining activities. I especially love water, particularly a sparkling mountain stream. I guess it’s because I’m a water sign. It just makes me kind of bliss out. And there were plenty of beautiful streams in the mountains! It’s not always easy. All that walking can be really tough, especially if the terrain is rough, or if we have to do a large amount of walking in a day. One day in the Mojave we walked 15 miles in one day! That’s just walking back and forth in straight lines all day! We didn’t find much that day, so we covered a LOT of ground! It would have been nice to find something, because then we could have had a break from walking. 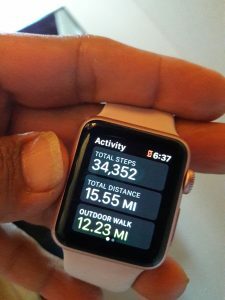 They talk about getting 10,000 steps in a day. That day I did over 34,000 steps, burned about 2700 calories, and got blisters on my feet! But I ate well while I was there because I had all that great food I brought! 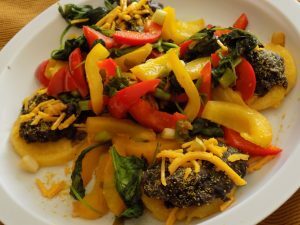 Polenta discs with refried beans, bell peppers, and Daiya cheese. I also did my yoga every morning before work, which is essential for me. It really helps me keep limber and energized when I do yoga every morning before work, and sometimes at night too. While I was on this particular job, I did a lot of yoga poses to help my sore feet. It’s also not easy always being away from home, but we always get to stay in a comfortable hotel or air b and b. We stayed in some especially nice ones in Gunnison, CO. We had anywhere from 3 to 6 people staying in a house, but it was very comfortable, we had a real kitchen to cook in and somehow I always ended up with the big bedroom! Later in the fall, I got hired by another company that had gotten the new contract at Fort Carson. None of my previous work buddies were there, but the new crew is really fantastic! They are great people and we make a great team. 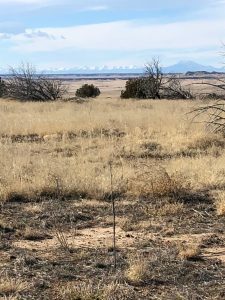 Some of the field work is on Fort Carson proper, which is close to home, so I don’t have to travel so much. 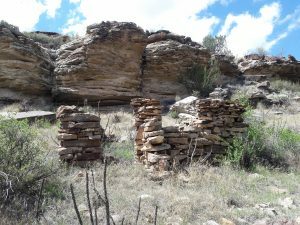 But I do like it when we get to go down south to the Pinon Canyon Maneuver Site, because it is really beautiful down there and there are so many archaeological sites! 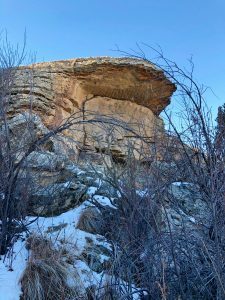 There’s a lot of prehistoric sites there like rock art and rock shelters, where ancient Native Americans lived, made tools, hunted and gathered, and raised their families. There are also lots of old homesteads that hardy and determined people built from local stone and mud. It must have been really difficult for them to live on that land, because it can be quite harsh, but it is truly beautiful and magical in its own way. In late summer last year, there were fields of sunflowers that stretched on for miles. It rained quite a bit in the evenings, which leaves the roads really muddy and undrivable, so sometimes we had to drive through the flowers to avoid getting stuck in the mud! Speaking of getting stuck in the mud, we got stuck our very first day out and had to have a fire truck come pull us out of a big, muddy hole! How embarrassing! But we made it out, and had our lunch at a beautiful high point overlooking Red Rocks Canyon. Since the contract got started so late, winter came on and we are still doing some outdoor field work, but honestly, that’s what I love most about my job. I don’t mind braving a little bit of cold weather if it means I don’t have to be sitting at a desk all day. So, that was my year in archaeology in a nutshell, and I hope you learned a little something about what it’s really like to work in archaeology. Now this is not the only type of work that archaeologists do. It all depends on what area you work in, what your level of expertise is, and how long you have been working in the field of archaeology. Some archaeologists become professors, museum curators, GIS specialists, lab analysts, or work at the administrative level, but nearly all archaeologists do field work at some point. For me, it’s definitely the most fun, although the most physically demanding, part of a career in archaeology. Fields of sunflowers behind me. Do you want to know more about what archaeologists do? Are you interested in a career in archaeology? Please leave a comment or a question. 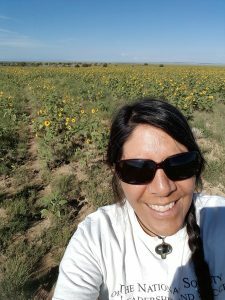 I would love to answer any questions you might have about archaeology or becoming an archaeologist! If you would like to see more of my year in archaeology, check out my YouTube Video below.